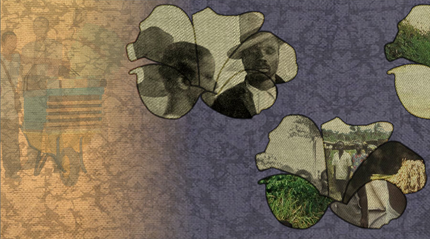 The Living Liberia Fabric, initiated in affiliation with the Truth and Reconciliation Commission (TRC) of Liberia, is an interactive, web-based narrative supporting the goal of lasting peace after years of civil war (1979-2003). It links concerns for liberation, dignity, and the future with needs for cultural foundations, human rights, truth, and reconciliation. Our system is based in Liberia's culture and the specifics of the conflicts, hence representing our cultural computing perspective. While Liberia has often been hailed as one of the only African nations never to be colonized, the historical facts are more complex. The settlements of repatriated Africans were in fact, governed by white American agents of the American Colonization Society for the first several years of their existence. … the American Colonization Society, and later the fledgling Liberian government, was at war with various indigenous tribes over territory and trade routes throughout the 1800s. Liberia’s complex history created a 'state of contestation' which remains today a major source of conflict and disunity. "Collective memories built around war and violence play an important role in the process of rebuilding positive ties between the different segments of a society." The Living Liberia Fabric is a war memorial with characteristics of a peace museum; it emphasizes human dignity and escaping the clutches of colonial and post-colonial ills. The Living Liberia Fabric resembles a traditional West-African textile. 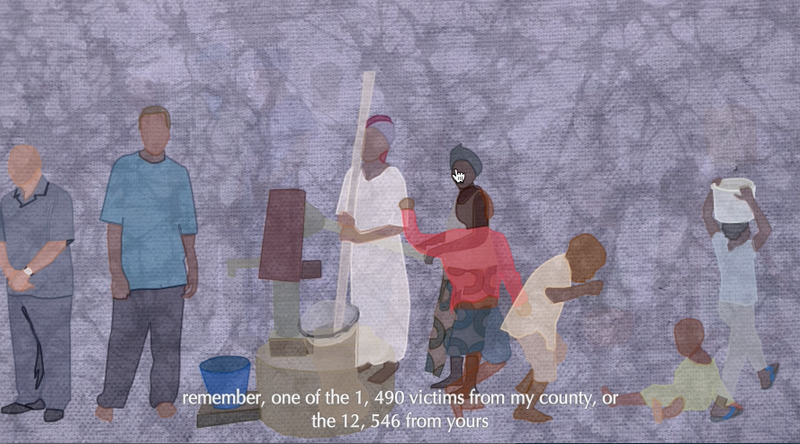 The system begins by displaying illustrated figures representing different stakeholder groups as the sound of the ocean plays in the background, creating a reflective space for mourning. Exploring the image interactively, by moving a cursor over a figure, causes ghostly figures related to that stakeholder to fade in around it. Subsequently, it features a pattern composed of shapes such as flowers or diamonds. These shapes act as frames for displaying assets such as video clips and archival photography. As the system runs, poetic captions frame a narrative that provides background information on the war, reflections by stakeholders, and ideas to support peace and reconciliation in the future. The user’s input guides which stakeholder groups and other themes the story focuses on. At the same time as the users selects aspects of the narrative’s direction, Harrell's AI system called GRIOT serves two functions. GRIOT generates the narrative text displayed as captions and ensures that the next assets to be displayed are coherent with the stakeholder group, theme, and visual qualities of the user’s selection. We believe that the Living Liberia Fabric memorial, rooted in Liberian culture, effectively tells multiple Liberian stories, counteracting phantasms of civil war that enable subjugation, violence, and oppression while supporting the needs for survival, human rights, and the empowerment of the Liberian people.